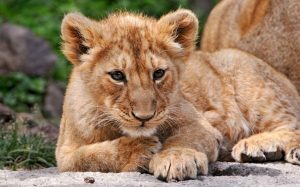 A member of the feline species widely given the epithet, ‘the king of beasts,’ the Asiatic lion, also known as the Asian, Indian and Persian lion, is one of the five big cats found in India, besides the Bengal tiger, Indian leopard, snow leopard and clouded leopard. 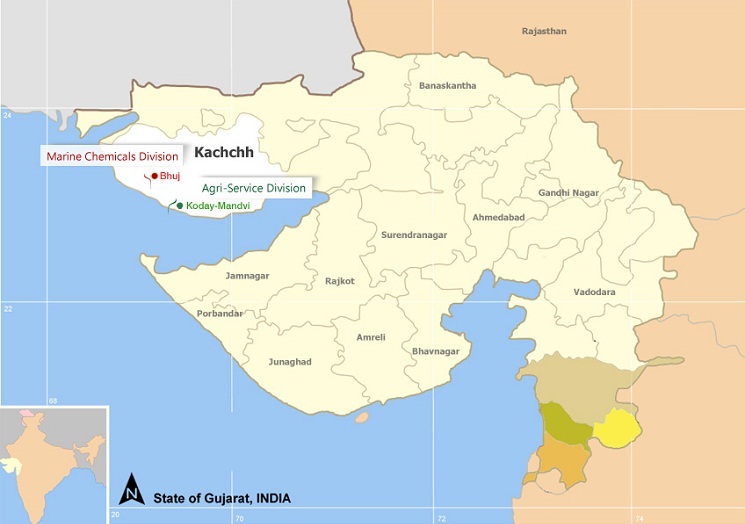 It is also the only big cat in South Asia, mostly confined to a single area around the Gir National Park in Gujarat. Its physical magnificence, though lesser in appeal than the Bengal tiger and African lion, is still a sight to behold. Head-body length – Male lions reach a length of 5.5-8.2 ft (1.7-2.5 m), while females reach 4.6-5.7 ft (1.4-1.75 m). Weight – Males weigh 352-419 lb (160-190 kg), and females 243-265 lb (110-120 kg). Height – They are 3.5 ft (107 cm) at the shoulders. Tail length – The tail of the Asiatic lion is usually 28-41 in (70-105 cm) with a large tuft at the end. Color – Their pelage is ruddy-tawny with black specks to buff-gray or sand colored. Sexual Dimorphism – Only males sport a mane, and are larger than females. Asian lions have bifurcated infraorbital foramina in their skull, which are holes which allow blood and nerves to pass to the eyes. African lions have a single infraorbital foramen. Asiatic lions live in tropical grasslands, tropical dry forests, semi-deserts, and deserts. 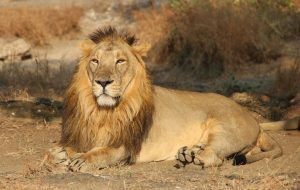 At present, Asiatic lions inhabit the Gir Forest in India. Asiatic lions, like their African cousins, are highly social animals. They live in prides of up to 5 females. Males associate with the pride only during mating and large kills. Females of a pride cooperate to bring down prey. They are active only for about 4 hours a day, spending the remainder in sleep or at rest. Male Asiatic lions defend their territory from marauding rival males. If defeated in the fight by way of submission or death, the younger victor takes over the pride and territory. Once a prey has been killed, the whole pride, including a male, who may or may not have partaken in the kill, starts devouring it. The usual pecking order is led by males, followed by older females, sub-adults, and cubs. They mark their territory by roaring, urine spraying, and scuff-marking. Mating season for Asiatic lions continues throughout the year. The gestation period lasts for between 100 and 119 days, after which a litter of up to 6 cubs is born. 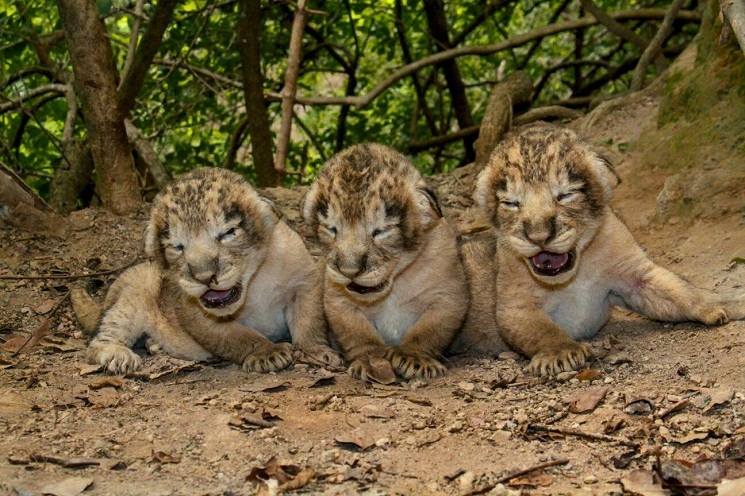 Cubs are born blind and can open their eyes after 11 days. They start walking when they are 15 days old and run by 1 month of age. They are taken care of by all the females of its pride. 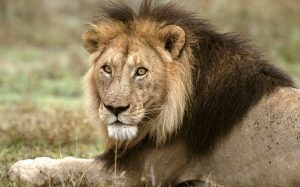 Males that take over the pride kill cubs belonging to the defeated male to ensure that the lionesses attain estrus in a few weeks so that he can copulate and his progeny is carried forward. 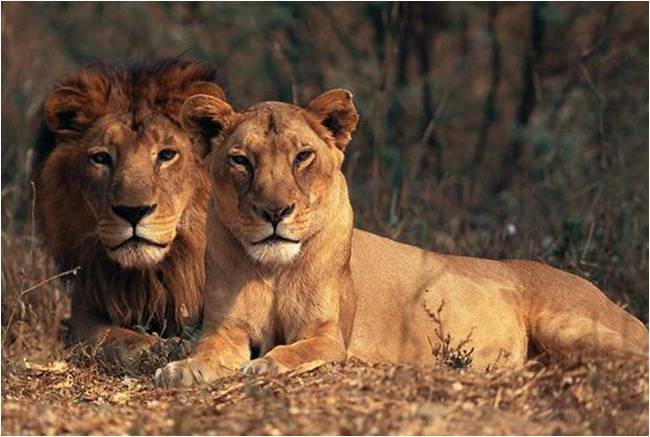 Male lions become sexually mature at 5 years of age while lionesses attain gusto at 4 years. Females may survive for 17-18 years while males live for around 16 years on average. Being a big cat, the Asiatic lion has the ability to roar. 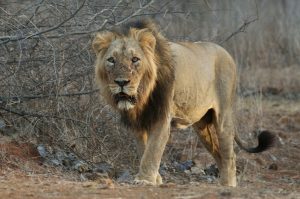 Males start to roar by the time they are of 1 year, with lionesses starting soon after. Males’ roars are louder than the female’s, and if unhindered by vegetation can be heard for miles on end. Besides roaring, they also growl, grunt, snarl and use tactile methods for communication. Manes of a male lion advertises his health and fertility to the others of his kind. Asian lions eat ungulates available in their range, namely deer, antelope, buffaloes and wild boar. Retractable claws on the Asiatic lions are crooked to allow them to hold on the prey they have got their paws on while their teeth deliver the killing bite. The rough surface their tongues help scrape the meat off a carcass right to the bone. Their eyes can see many times better than human vision in the dark. The mane, besides adding ornamentation to male Asiatic lions, must have provided them a strong armor against the only potential competition they might have had overlapping its range, the Bengal tiger, which usually kills with a bite to the throat or the neck of its victim. 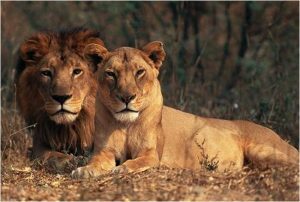 The Indian lions do not have any natural predators in their habitat as they are at the top of the food chain in the ecosystem. 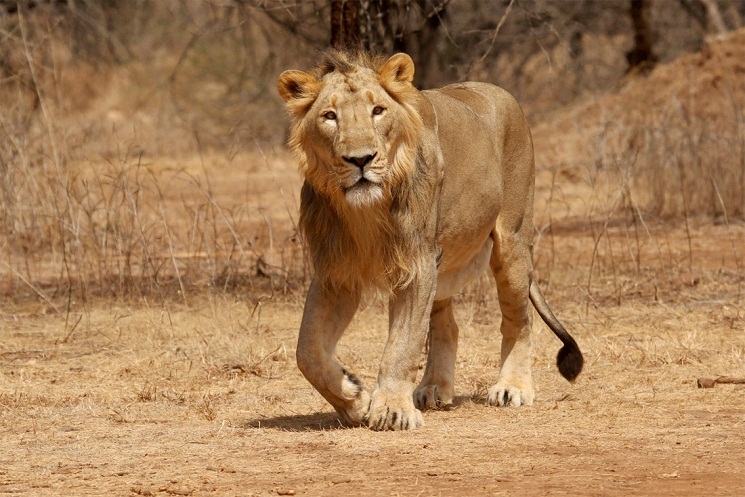 Asiatic lions have been listed under the ‘Endangered’ category of the IUCN Red List. 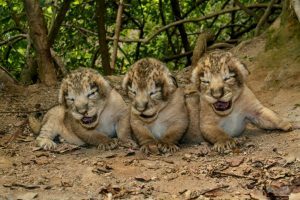 As per a 2015 census, the Gir forest and surrounding areas were said to contain an estimated 523 individuals, comprising of 109 adult males, 201 adult lionesses, and 213 cubs. 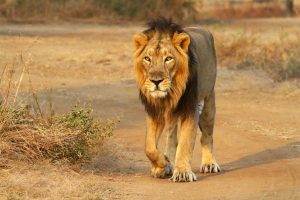 Currently, efforts are underway to introduce Asiatic lions into the Palpur-Kuno Wildlife Sanctuary in the state of Madhya Pradesh in India. This will bring the lions in proximity to Bengal tigers already inhabiting the vicinity. Asiatic lions were on the brink of extinction with about 12 individuals left when an Indian Nawab (king) forbade the hunting of lions and confined the remaining lions in his private hunting grounds in an active conservation effort. The historic range of the Asiatic lion included Southeastern Europe, Black Sea basin, Caucasus, Persia, Mesopotamia, Baluchistan, and the Indian subcontinent from Sind in the west to Bengal in the east.